Did you know that every time you wash clothes, tiny microfibres escape into the water system? If your clothes are made from natural fibres this isn’t a big deal. But if you use any polyester or other plastic-based man-made fibres, these microfibres get into our rivers and oceans. And we’ve all seen the coverage of the horrific problems of microplastics in our water, right? try to buy clothes made of natural fibres such as organic cotton clothes from Piccalilly. But their school uniforms are polyester blends, as are some of my favourite dresses. When I looked at the labels, I was surprised to find out just how many of our clothes do have man-made fibres in them! From swimming costumes to bras and socks, I guess your drawers also have a lot of man-made fibres in them. So when I spotted a potential solution, I was intrigued. 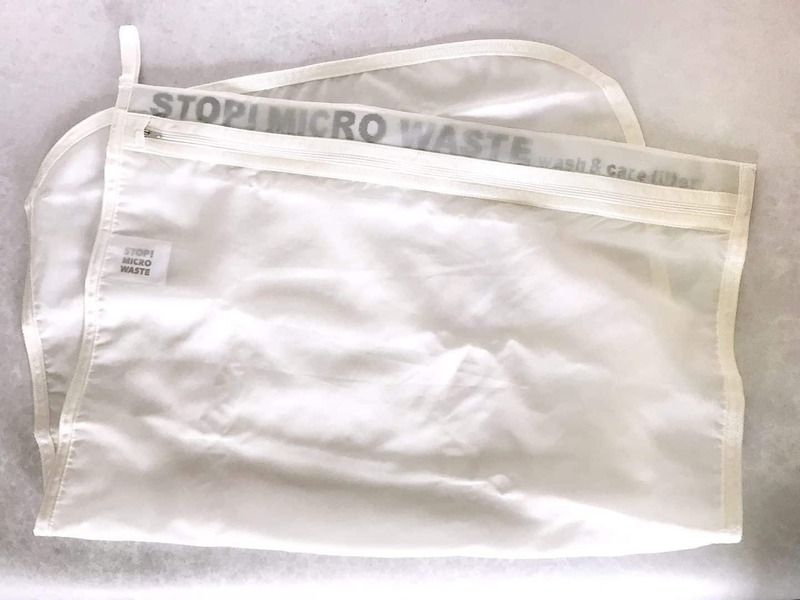 What is a GuppyFriend Eco-Friendly Laundry Bag? The GuppyFriend bag is a large bag, with a covered zip. You put any clothes made of man-made fabrics into it, and wash them as normal. It arrives in a recyclable cardboard sleeve. It is made of plastic, but it doesn’t shed microfibres, and is a lot softer and silkier than I was expecting. 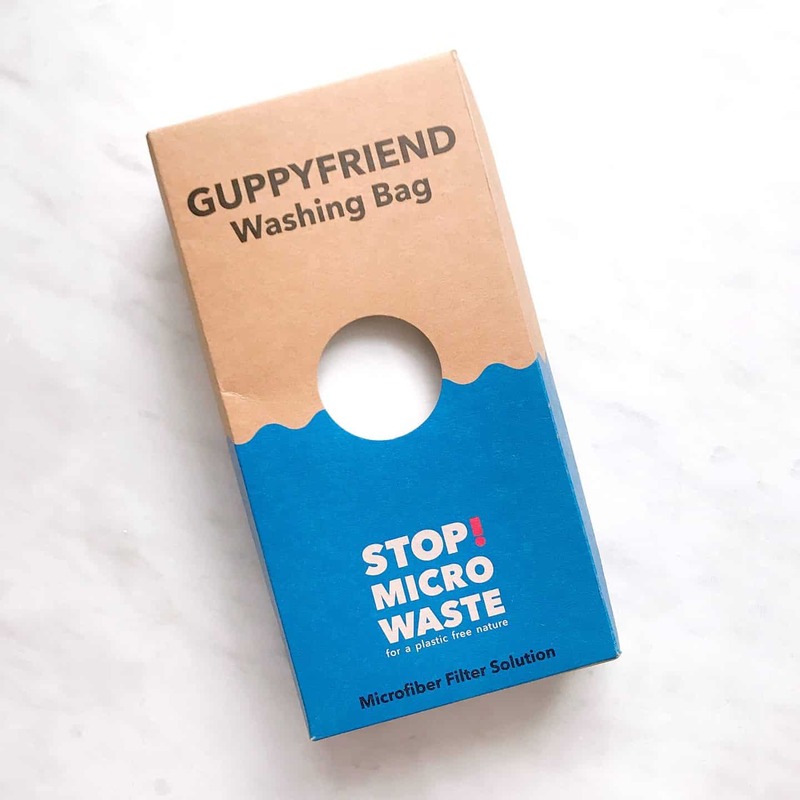 The microfibres that would have been washed down the drain collect in the seams of the GuppyFriend Washing Bag. You simply take them out and put them in the bin. Look closely at the photo below – can you see the dark fluff in the seam? 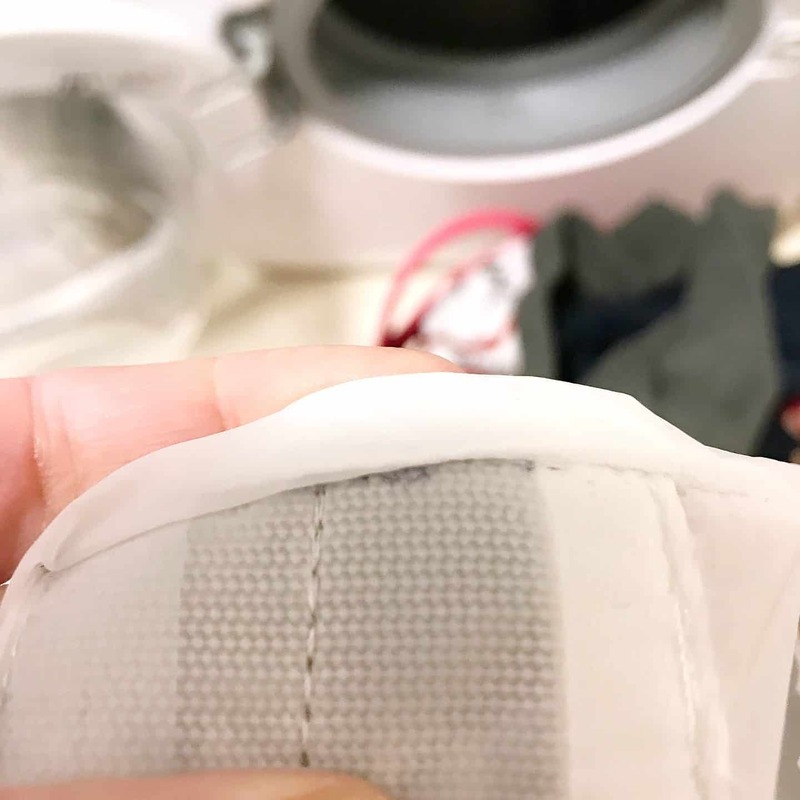 That’s the microfibres the GuppyFriend has collected from one wash.
Look closely and you can see the dark microfibres captured along the seam of the bag. You can buy a GuppyFriend Washing Bag at Ethical Superstore here for £25*. I do think it’s a good idea in theory. Unfortunately, I’m not sure that it will make a huge difference to the plastic pollution problem, unless everyone uses them. And that’s unlikely due to the cost and additional effort involved in sorting the laundry. I’ll keep on using mine as I have bought it, but I don’t think I would replace it if it tore. I am also trying an EcoEgg Laundry Egg, which costs £12.99 from Ethical Superstore*. It’s available in two fragrances, and an unscented version. The reduction in plastic waste is also brilliant. 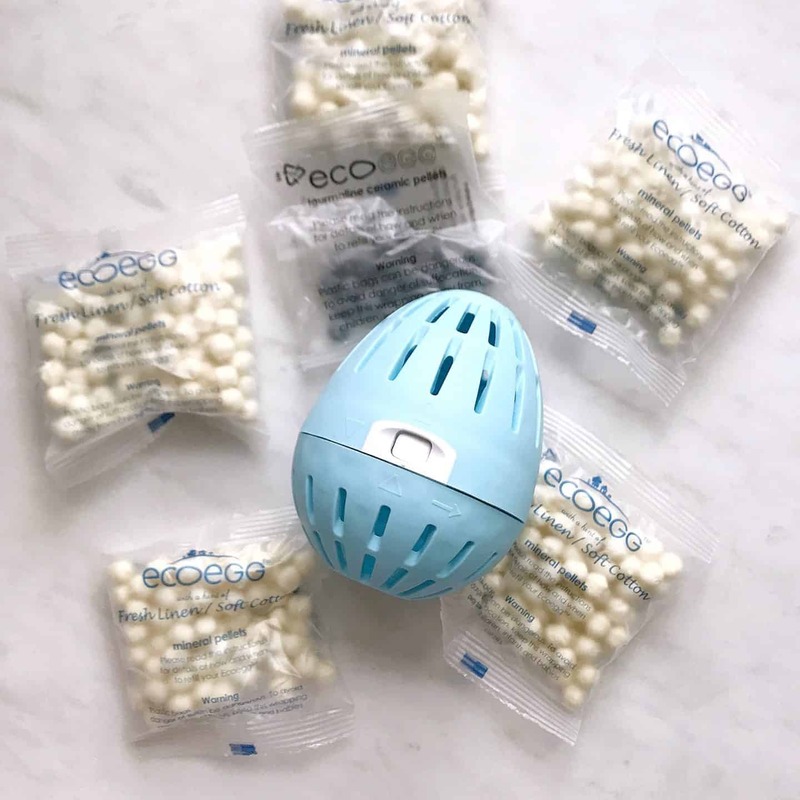 The EcoEgg comes in a cardboard box, with paper instructions, and the pellets come in recyclable plastic bags. For one EcoEgg, you’d get through 5 Ecover bottles, 4 Persil bottles or 6 and a half Sainsbury’s bottles! It’s super easy to use. 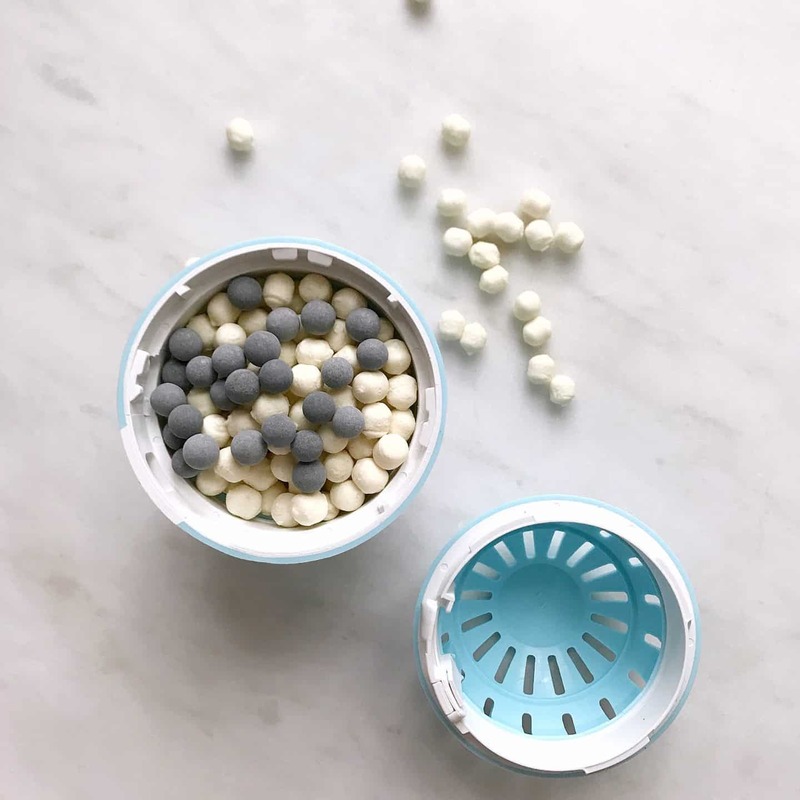 Just add in the correct amount of pellets, and lock it, and it’s ready to go. 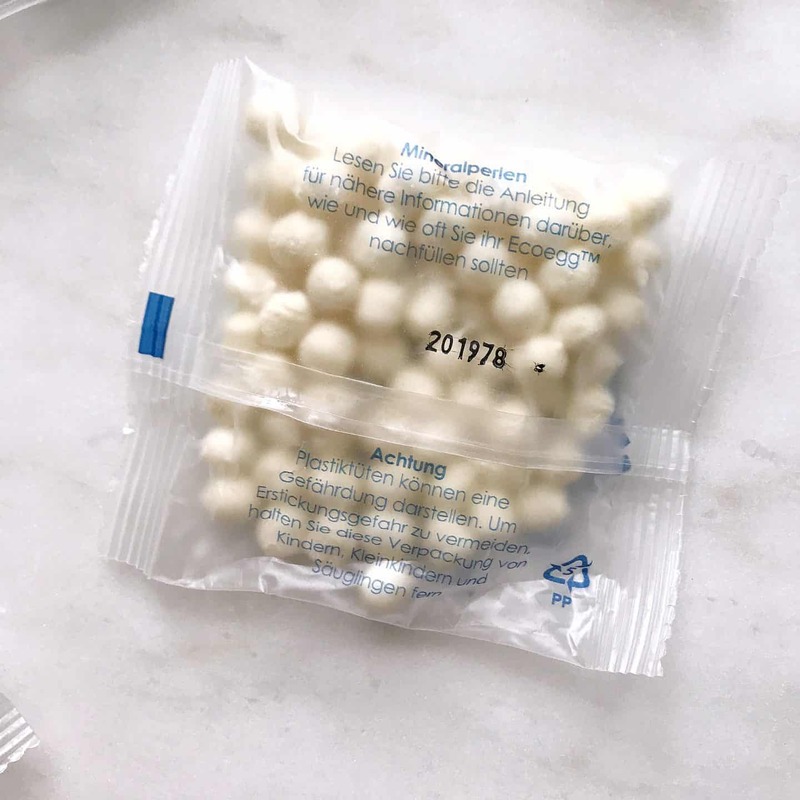 There are two extra packets of the white pellets. You use to them to refill the EcoEgg as the other ones wear out. 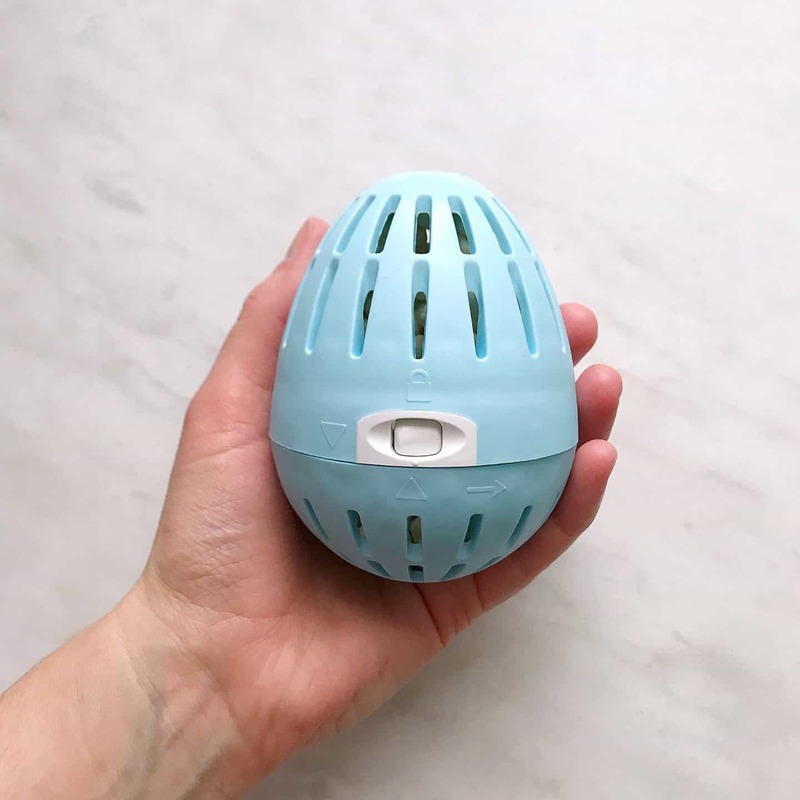 The Eco Egg comes with enough mineral and tourmaline pellets for 210 loads of eco-friendly washing. … lock it and pop in in your washing machine. 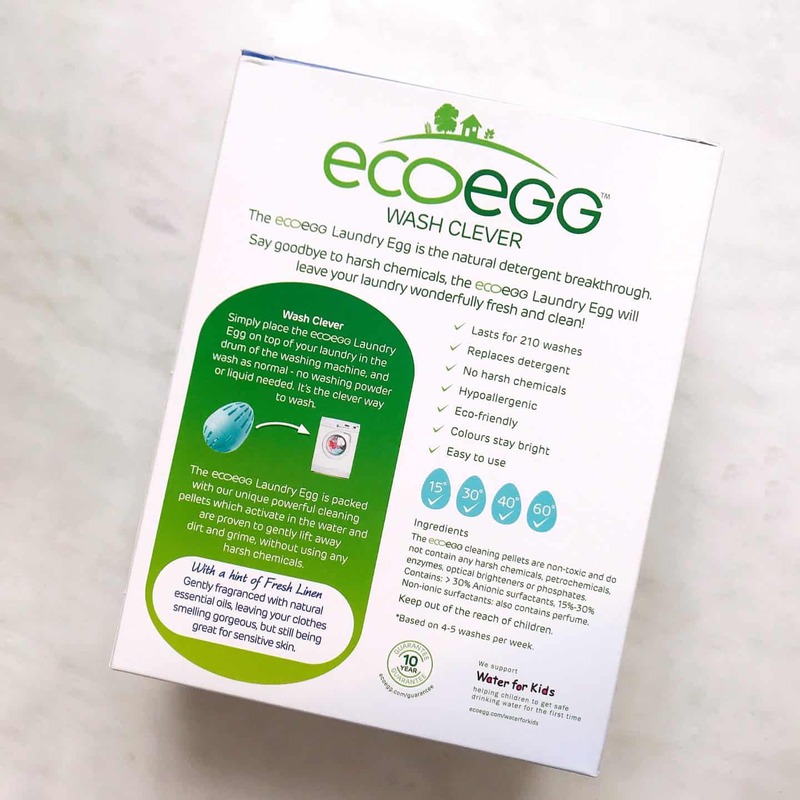 It’s really easy to use the EcoEgg each time you do a wash. Just pop it onto the top of the washing in your machine. The clothes come out clean and smelling fresh. Although I haven’t been using it long, I think it’s a great eco-friendly laundry solution. I’m not sure if it would be effective on heavily stained or greasy clothes, as our clothes don’t really get that dirty. 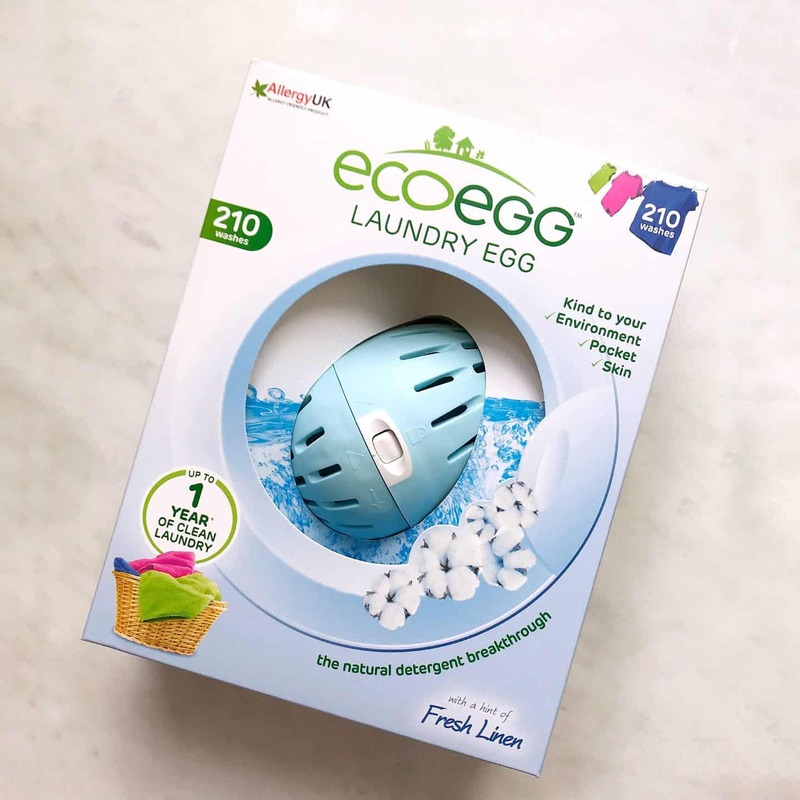 You can buy the EcoEgg Laundry Egg for £12.99 from Ethical Superstore*. For day to day washing, it works really well for us, and will also save us money. 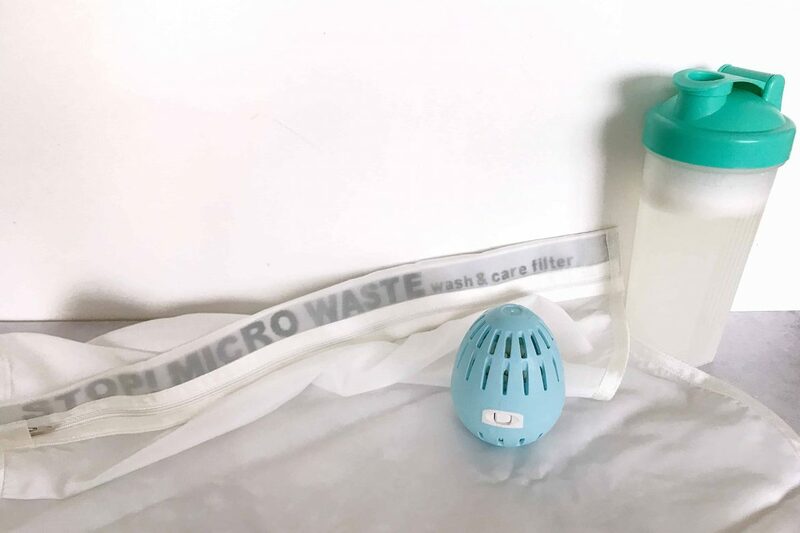 There is one big problem with the eco-friendly laundry solutions I’m testing – you can’t use them together! The Guppy Friend bag needs to be used with liquid laundry detergent. I messaged the guys who produce the GuppyFriend to ask if the EcoEgg is OK to use and they said. So I have gone back to making my own eco-friendly laundry detergent to use with the GuppyFriend. It does work well but is a little bit of a faff compared to just buying it from a shop. It’s much cheaper though, and Ava’s eczema got loads better when we used it. You can read about it and follow my ‘recipe’ below. How do you dry your laundry? We don’t have a tumble dryer and do not plan to get one. Drying laundry outside is of course the most eco-friendly way, but our climate can make that impossible. As well as a rotary airer outside for the summer, we have a few clothes airers. *My favourite airer (yes, I do have a favourite airer, he he) is a heated airer from Lakeland. I have the three tier Dry:Soon heated airer, which is £119.99. According to Lakeland, it costs less than 6p an hour to run. My parents bought it for us when Ava was born eight years ago, and it’s still going strong! You just plug it in and switch it on, and it heats up to dry clothes much quicker than a normal airer. It’s much more eco-friendly than using a tumble dryer. Do you have any eco-friendly laundry tips to share? I’d love to hear them, please leave me a comment below. 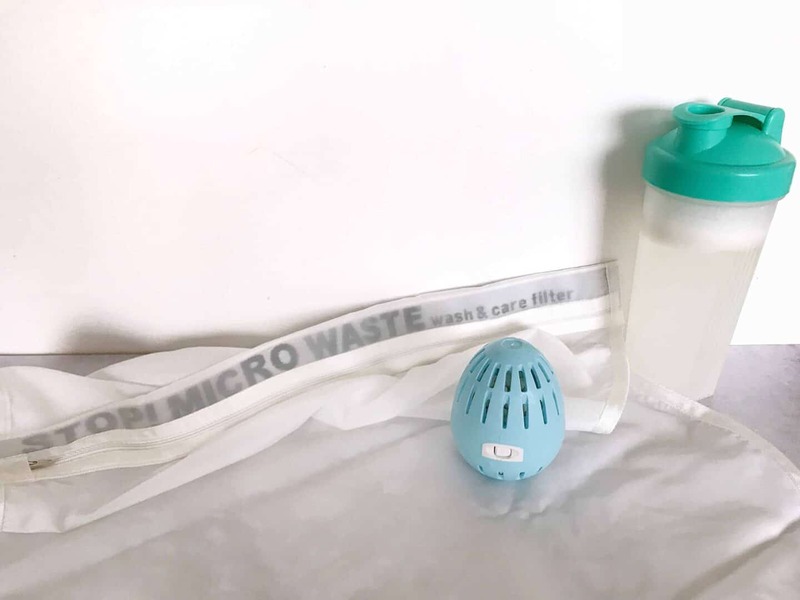 If you’re interested in making your home more eco-friendly, you might like my post about eco-friendly cleaning, here.